Addis Ababa, the capital of Ethiopia, is a city of about 5 or 6 million people. It was established as the first permanent capital in the late 1800s when King Menelik II brought eucalyptus trees to Ethiopia. Prior to the introduction of these trees, the capital was moved every few years, as the trees were cut for firewood and building. The eucalyptus trees can be harvested in only 3 years, so this allowed a permanent capital. Addis is located almost in the center of Ethiopia, and all roads lead to Addis. People who need anything come here. It is the only real link with the outside world. And in the past 10 years tremendous development has taken place here. Everywhere you turn, the roads are under construction as they try to pave and expand the road system. Buildings are now going up; for the first time you can see 3-4 story buildings! Still much of the city contains the one-story simple houses, with outside cooking, pit toilets, etc., but it is beginning to look a lot like any other city in the developed world. Of course, with the people come the transportation issues. There is no metro system or freeway. Only the “wealthy” own cars. Most people move about the city by walking, by taking a taxi, or by riding a “Blue Donkey.” Now, I know you’ve heard of a Blue Donkey before! It’s a mini-van that is painted white on the top half and blue on the bottom half. I was told today that this name Blue Donkey was given by foreigners. Each Donkey has a route. Of course, in true African style, there are no signs as to where the routes go, where to get on, etc. It just somehow flows. Everyone knows where to go to get what Donkey to get to such-and-such a place. And if you happen to be one of the ignorant on the street, in true African style, there are many who are willing to help you! To get from our house to the hospital, it requires 3 Donkeys. I have yet to see a perfect Donkey; they all bear marks of their escapades. But they are operational. On most of them, the door closes, the tires are inflated, and the motors run. The inside seats have minimal cushion and almost no leg room. But they get you there for a decent price, and that’s the important thing. Round trip to the hospital costs about 50 cents per person; we can afford that! The greatest challenge we’ve faced is that, outside our house, these Donkeys are always full, so we’ve discovered that by walking ½ mile up the road, we have a better chance of getting a Donkey that can accommodate us as passengers. Our first Donkey takes us to “Mexico,” then we walk about ½ mile to board the Donkey that takes us to “Bole,” then we cross the street and hail a Donkey to take us to “Gerji,” where the hospital is. One look at Aberesh in her fully pregnant state and the Donkey usually knows our errand! The operation of a Donkey is amazing and very efficient. There are two men per Donkey. One is the Driver and one is the Organizer. Both are amazing to watch! The Driver gets in and out of such tight squeezes. 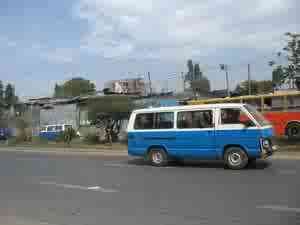 Driving in Ethiopia has little regard for the marked lanes on the roads, but regard for red/green lights is increasing. Most places have circles instead of red/green lights, and sometimes it’s wild getting into the circle and exiting the circle in one piece. The Organizer is also an extremely gifted man. He hangs out the side window calling to people the destination of the Donkey, and then he opens the door and exits to bring customers into his Donkey. He’s a master at handling the door with his feet, head, and arms. While the Donkey is traveling, he collects the fare from each customer. Everyone enjoys watching me try to speak in their language. They are really pulling for me, helping me, smiling gently. Once I was practicing the word “Woeraj.” I accidentally spoke it loud enough for the driver to hear, even though I was on the back seat. He pulled over right away, so I had to apologize. “Yikerta!” Everyone laughed at that one. So the next time you come to Addis, I will be happy to serve as your Blue Donkey tour guide. I can get you between this house and the hospital!